All available rental property at Heimavellir‘s disposal is advertised on the company's website heimavellir.is and on its Facebook page. You can only apply for the apartments advertised there by clicking on the "apply" button in the ad. 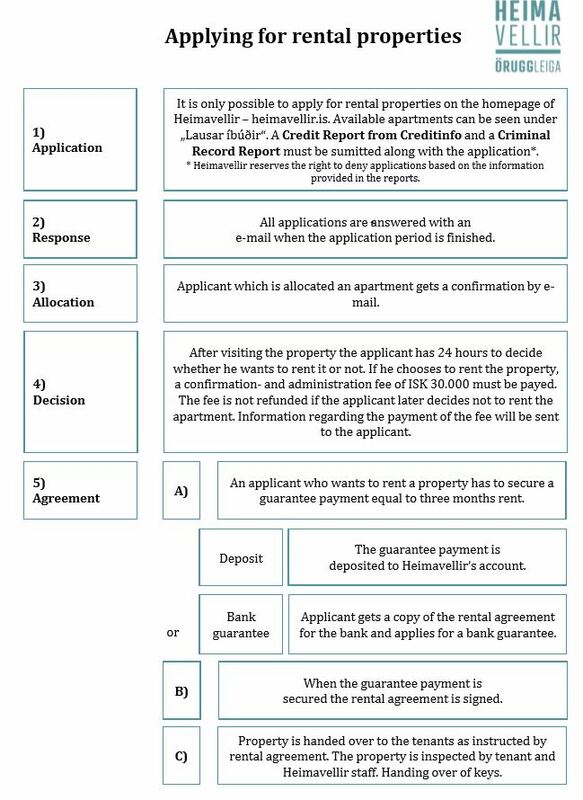 By applying for a property, the applicant acknowledges and accepts that Heimavellir may check the applicants Credit Default Report from Credit info. Heimavellir reserves the right to deny an application based on the information stated in the Credit Default Report and in Heimavellir’s own historical creditor data. All available apartments are advertised on www.heimavellir.is. Heimavellir reserves the right to deny an application based on the information provided in the reports and to subsequently allocate the property to a different applicant. If the applicant is allocated an apartment, he/she will be contacted by Heimavellir and offered to take a tour of the property. After the tour, the applicant has one day to notify Heimavellir on whether or not they would like to lease the property. If the applicant declines, does not contact Heimavellir within the given time-period or fails to meet requirements regarding allocation of a property, the property will be allocated to a different applicant. Expenses incurred in obtaining any of the required documentation will not be reimbursed by Heimavellir. A temporary written lease for a period of 12 months is signed or an indefinite lease. A lease is always renewed upon the tenant‘s request, except in the case of default on the part of the tenant in accordance with the lease and rent regulation. A fixed administrative fee is charged at the beginning of a rental period (30 000 ISK for each apartment). - Preparation of a lease agreement. The administrative fee does not cover damage to the apartment detected at the final inspection or the cost of repainting the apartment, if necessary. If problems arise regarding damages to the apartment during its return, the tenant receives an invoice for estimated costs in accordance with a report by an independent assessor. Before a lease is signed and an apartment allocated, the tenant must make the payment of the required deposit or submit a bank guarantee amounting to an equivalent of three month’s rent and its validation period must be a month longer than the rental period, before a lease is signed and admission to the property is granted. Rent must always be paid on the first day of each month, and debt collection services take care of lease payments. The deposit during the rental period is index-linked. In the case of an indefinite lease agreement, the lease payment amount is to be reevaluated every eleven months. In the event of termination of the lease during a 12-month lease, the notice period for Heimavellir is 3 months. If the lease is indefinite, the notice period is 6 months. Termination must be submitted in writing and substantiated. The notice period commences on the first day of the following month. During the notice period, the tenant is obliged to show his/her apartment to prospective tenants. Such visits must be announced reasonably early. The tenant or company agent is always present during such visits. The principle rule regarding the return of apartments is that floors and walls are clean and not damaged (no nails or holes) and painted surfaces are in good condition. Windows and balcony doors should be clean. Floors must always be clean (not necessary to polish the floors). Clean all the ventilation shafts and cabinets on the inside and outside along with the equipment belonging to the apartment. There should be functioning light bulbs in all rooms. Painting of rental apartments may only be carried out with the prior permission of the landlord and at the tenant‘s expense. Upon return of the apartment and after an associate of Heimavellir has appraised the property, it is ready to be allocated to the next renter. If the tenant officially registered the Lease Agreement with the District Commissioner, he/she must withdraw/cancel the registry at the end of the lease period. Failure to so will cause a delay in returning the tenants deposit. The tenant must submit the original copy of the lease to the office or auditor, with the sentence "Approved for cancellation" on the back and signature. Heimavellir takes care of the formal procedure of cancelation of the lease. If the lease is not submitted, it delays the entire process. After the final appraisal has been carried out, the tenant is not required nor allowed to perform any repairs in the apartment, the apartment should be ready for return by the time of the final appraisal. The tenant is obliged to take good care of the rented premises and use it in accordance with the agreement. If the rented apartment or any of its equipment is damaged by the tenant or other persons whom the lessee has allowed to use the apartment, it is the tenant‘s obligation to repair the damages as soon as possible. If the tenant neglects his/her duties, the landlord may perform necessary repairs at the tenant‘s expense. Beforehand, however, the landlord must grant the tenant a month to complete the repairs. The landlord should perform repairs to windows, electrical appliances, sanitary appliances and other equipment, if the tenant can prove that damages cannot be attributed to the negligence or fault on the part of the tenant or persons associated with him/her. The landlord is responsible for mowing the grass. The tenant is obliged to maintain locks, water taps, electrical sockets and other small items at his/her own expense. The tenant should also maintain the painted surfaces in the apartment. The landlord shall always keep the rented premises in rentable condition, i.e. renovate interiors, floor coverings, carpets, etc. at appropriate intervals, in accordance to good practice in the maintenance of apartments. Such damage to the rented apartment as is recoverable under the conditions of ordinary homeowners insurance should always be covered by the Lessor. It is not the landlord‘s responsibility to connect the phone line into the apartment. The tenant can choose and cover the costs of installing a phone. This list is not exhaustive, it is only an example of what costs the lease can cover. - Cleaning in common areas must be performed in accordance with house rules established by each house.